After 12 years of service with the Virginia Army National Guard and two tours in Iraq, Anderson Alleyne began his career with the Architect of the Capitol (AOC) in 2013. He was hired as a night shift laborer in the Capitol Building jurisdiction and was responsible for maintaining the building's south-side floors. After a year in that position, he applied for a job in the House Office Buildings' Elevator Shop. Thanks to key preparations he made along the way, he got the job and has been promoted every year since then. This is his story — one he hopes inspires others in their professional journeys. When Alleyne applied for the House elevator mechanic helper position, he met his future supervisor, Paul Miller. Miller has spent the majority of his 30+ year federal career with the AOC. He has been a champion of the AOC's creation of programs that help promote agency employees such as the Architect’s Mobility Program, Student Loan Repayment Program and opening positions to in-house employees only. Miller is a huge proponent of hiring from within, "When we hire people from outside the agency, we are overlooking diamonds in the rough within the agency. You just have to find them. They are there." Anderson Alleyne began his career with the Architect of the Capitol in 2013. And for Miller, those "diamonds in the rough" are the employees who have prepared in advance for their next opportunity. He explained, "I think employees sometimes wait for an opportunity instead of already being prepared for when the opportunity presents itself. No one came into the elevator trade knowing how to work on elevators, but if you have a strong work ethic, come to work willing to take instruction and attend training, you can succeed." Fortunate for Alleyne, he had made those advanced preparations. He was one of several qualified candidates for the job, but for Miller, two things made him stand out — his electrical background and strong work ethic. 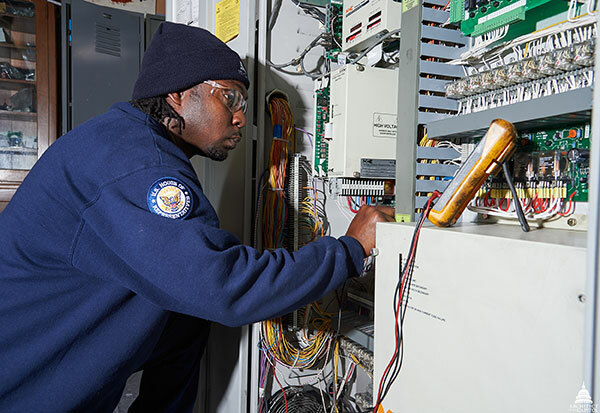 Before beginning his career with the AOC, Alleyne earned a degree in electrical and electronic engineering technology at Virginia State University — a key step that helped prepare him for this job. Alleyne was hired as an elevator mechanic helper and has taken full advantage of the career-ladder wage-grade position by participating in on-the-job training and taking agency-sponsored courses. Today, he is a full-fledged elevator mechanic and an inspiration to both Miller and his colleagues. His success has been noticed, and naturally that garners some questions from others hoping to replicate it. His advice is simple, "Don't give up." Alleyne has seen many colleagues apply for a position once or twice, but then never apply again. He says it’s all about timing, "You might not get it the first time, but you cannot give up. Some people keep applying, and they’re always the ones that succeed. It's easy to get discouraged, but you have to keep trying." Alleyne's story is one of success, but he admits some days bring more challenges than others. He chooses to see them as educational opportunities, "You don't always have the answers to the problem. Sometimes you have to take a step back and see what you did wrong, see what you did right and try to resolve the problem. Sometimes you can't fix an issue on your own, and I'm not afraid to ask for help. I'm still learning. The day that I stop learning is the day that I stop progressing." Alleyne uses a multimeter to diagnosis a problem with an elevator controller. What motivates Alleyne to keep learning and moving forward? Without pause, he answered, "My family — my three sons and my wife. Some days are good days. Some days are bad days. But I put that key in the door, look upstairs and see my sons looking over the foyer and hear, 'Good morning, Dad!' That makes it all worth it." His family focused mentality and time in the military offer some insight into why Alleyne's favorite part of his AOC job is the teamwork. Even though he works at night when fewer employees and people are around, there is still a sense of community. "I know we're all doing it for the same purpose. We're all one team, and it's nice to be a part of that team," he said. Indeed. A sense of teamwork helps remind us all of our common mission — to serve, preserve and inspire. Miller believes that mission becomes even more achievable when we provide opportunities to those who are already living it every day. He credits the AOC's leadership with sharing that vision from the top down, but also notes supervisors like him have an important role to play as they sit on interview panels and make hiring selections. He has been encouraged by how far the AOC has come, "The agency has come a long way in ensuring the room for growth is there for our own. When we make the investment in our employees, we all reap the rewards." Miller is also grateful that he's had the support of his supervisor — House Office Buildings Assistant Superintendent Dan Murphy. "Dan has made sure that we have the support and resources we need to do the best job we can while providing our employees with those growth opportunities whenever possible," Miller shared. 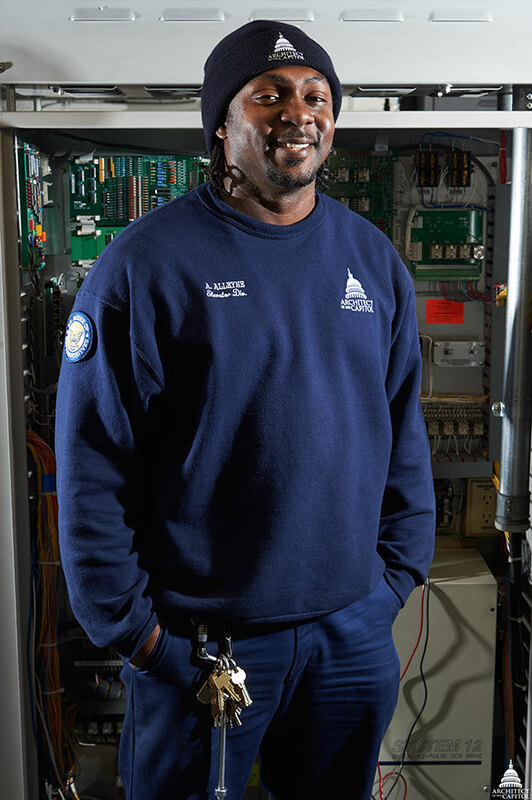 As the person responsible for coordinating the operation, maintenance, repair and replacement of the House's mechanical and electrical systems and equipment, Murphy is acutely aware of the unique skills required to care for the historical materials and equipment that encompass the Capitol campus. Often those unique skills are not readily available from an outside workforce, which is why it is so important for the AOC to develop its own employees. Murphy believes every employee is a valued member of the AOC team, "Everyone is a master at something. You just need to find it. Each of our employees brings something special and different to the AOC. Everyone has something to teach and something to learn. We must all be open to learning and available to teach." What a great story! Congratulations to Mr. Alleyene on his advancement in the AOC system. I thank him for his service to the country in the National Guard. I also commend him on his dedication to his family. He has made his own destiny, and will continue to do so. I wish him the best! Wow! What a great, inspiring, real story. Thanks for sharing! Congratulations Anderson! Keep climbing because the higher you climb the more you see. We are so proud of you. Congratulations Anderson! Wow this is such a remarkable and inspiring story. I truly believe we all have a mark in this world. Through your drive and motivation I can see you have found yours. Thanks for you service and also sharing your story to let those know that while we may not always get it the first, second..... time always push through and keep going. Everyday is a learning experience to do better, to know better and I couldn’t agree more..... “the day we stop learning is the day we stop progressing”. I am extremely proud you. Continue to strive and climb that ladder of success. Blessings to you always! Congratulation on your promotions, keep up the good work. Stay focused and God bless.